Topic: Need more room perhaps ! Re: Need more room perhaps ! Does your local fire marshall know just how much propellant you've got there? If you get tired of all that clutter, you can send it over to my place. It would fit in right at home. Controlled Madness. Yet I bet you know exactly where everything is. Need more room perhaps ! Topic: Any love for the Browning BLR? Topic: Black rubber Ruger Single Six grips. Re: Black rubber Ruger Single Six grips. 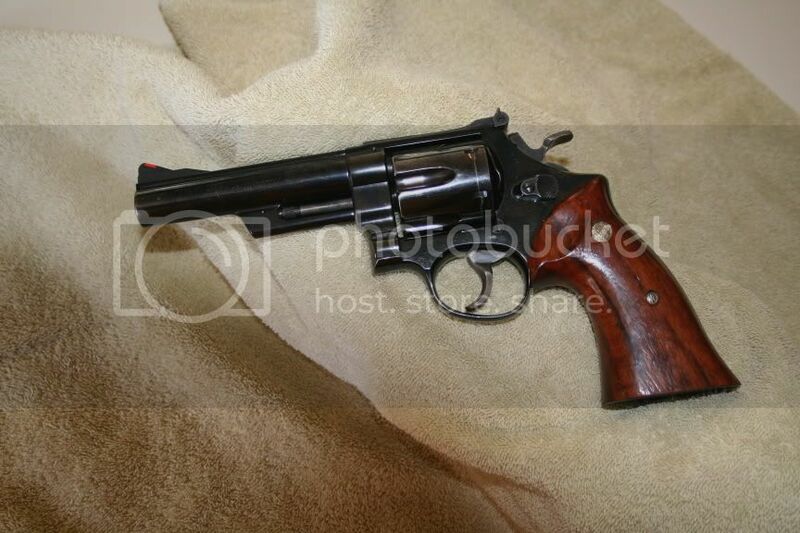 Once upon a time I purchased a circa 1957 Blackhawk in 44 MAG that came with Pachmayer grips . I tried to get some from the factory but they would not sell me any unless I sent the gun to get the transfer bar garbage installed so I had someone make me a set of maple grips . Topic: Speakin' o' dang snakes, see this one? Re: Speakin' o' dang snakes, see this one? There is atleast one black snake under the washing machine in my utility room . Just haven’t gotten motivated to move the washer and evict the darn thing . The volley gun while intresting isn’t my thing . But a punt guns a different story ! Ever since reading James Michners novel “Cheasapeake” I’ve wanted an English made punt gun . Just plain s...u...c...k...s to live on the left coast !